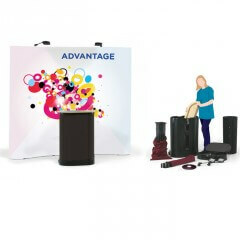 Pop-up bundles give you a full exhibition kit at a great price. An impressive pop-up stand with two powerful halogen floodlights and a wheeled case with a counter top and a graphic wrap. 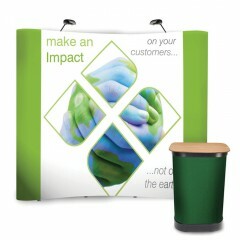 A great looking pop up display is all you need to make your presence felt and to get your message across. £416.00 £390.00 need help? contact us! Pop-up bundles are the most cost-effective way to buy pop-up displays. Pop-ups are the second most popular portable exhibition display. Frequently seen in shopping malls and airports pop-ups do have a fairly large footprint but are large, architectural and impressive. Pop-up display systems have collapsible frames and graphics attached by magnetic strips. Established in 1993, Fresco sells good quality portable exhibition displays at the best possible prices. All our displays are backed up by helpful support. Our pop-up stands are all printed and finished in the UK by Fresco. Our premium quality pop-up stand printing uses the latest print technologies. Fresco can meet the tightest deadlines on exhibition displays with our total in-house capability and wide experience. Fresco’s range of pop-up bundles and e-quick pop-ups offers solutions for everyone. Fresco is a leading UK supplier of all types of portable display systems and designs and manufactures backdrop display stands such as Curvorama which is an alternative pop-up display stand. We do not sell the cheapest pop-up stands as we assume our customers don’t go to an exhibition in order to look second rate. Our display stands do not compromise on quality and nor does our display print. And as a green and cost-effective alternative Fresco offers a full re-graphic service. We can fit a new print into almost any type of pop-up stand, almost any kind of portable display come to that.